Discussion in 'NASCAR chat' started by Restrictor Plate King!, Aug 9, 2014. You can a temporary 5th car for a rookie. REBS31, ChexOrWrex and (deleted member) like this. Rules say that a team can run a 5th car only if its part time, they just can't run a full time 5th car. As for the whole deal with who's car chase we'll be in, I'm not gonna get in another heated discussion about it since I've voiced my opinion plenty of times. But I still think chase will take over the 24 in 2016, and Kasey will get a contact extension after 2015. Mainly because I don't feel like there will be anymore drivers available to take over the 5, IMO. As a side note, it will be awesome to see Chase finally in a cup car. I'll look forward to Chase Elliott and Kyle Larson provide great racing amongst each other. I don't think 2016 not being discussed with Jeff is a sign KASEY IS GONNNNNE so much as why on earth would you discuss 2016 with Jeff when he's in the hunt for 2014? 34R7H130UND, Mr. Gregory and Greg like this. YEP. According to the "fans" on here that is. the pawn, Nitro Dude, Mr. Gregory and 3 others like this. Wonder which one of them will flop. Larson and Dillion are strong for rookies and Elliott has alot of pressure on him. If all 3 are the "next dale earnhardt/jeff gordon/jimmie johnson/etc.." then we could see one hell of a show for the next 20 years. Get That 88 Up There !! likes this. Dillon is a points racer. Larson and Elliott are going to win races and championships. One of the stars of the next 20 years could be someone we don't even see coming. Based on his performance in the BGN Series, who would have expected Jimmie Johnson to have the Cup career he's had? FenderBumper, Mr. Gregory and ztevans like this. Elliott and Larson have restored my interest in NASCAR. 97forever and ElliottFan like this. As long as Pop Pop is around Dillon will have a ride. For all the hype of him moving up and into the iconic #3 he's failed IMHO. Nascar com shows him in 15th with 1 top 5 and 3 top tens. On the other hand Chase looks like the real deal with Larson not far behind. Dillon's future will be pushing a pop corn cart thru the pits. 15th in points is nothing to sneeze at for a rookie. He's doing better than Logano did during his rookie year and look at where Joey is. He's also doing than Kurt Busch and a ton of other guys did in their rookie year. FenderBumper, ChexOrWrex and Mr. Gregory like this. I think Austin is doing better than a lot of people are giving him credit for. Larson has run up front more, but I think Dillon is having a decent rookie season as well. DUN24, Kiante, ChexOrWrex and 3 others like this. Pretty sure Gordon will retire after next year and Elliott will take over the 24 car. Drive to End Hunger is drastically reducing sponsorship next year and I have a feeling they will completely pull out in 2016. Elliott can bring the NAPA sponsorship with him. Again - Gordon will not just roll over & end his career for some young talent. He may hang it up if he wins the 2014 title, his back pain is too much and/or he has bigger fish to fry with his family. He's not a bad driver but I can't see him having much more than a Greg Biffle career. you do realize that Dillon is a first year rookie with those stats. Not saying he is setting the world on fire, but damn. Yeah I bet the Puppet Jr motorsports(really Hendrick) will field a cup car(s) with plenty of backups. 2. Doubt if Gordon is on the loop, he isn't a car owner, and Elliott doesn't need to take anything over, Jr motorsports will be the new race team, perfectly within the rules. Nascar might step in and say they can't be built under the same roof, no problem, drag it all over to Juniors shop and put it together. Can't really understand all the Kasey stuff. How many multi car race teams have all of there drivers doing great every year? Austin Dillon is a Cup Series rookie but the comparisons between him and Logano are laughable. Dillon had 145 starts in the NASCAR "major leagues" prior to his rookie season in theNASCAR Sprint Cup Series. That's a pretty considerable amount of seat-time, much more seat time than rookies that have set the world on fire have gotten before running Cup. Kevin Harvick had 101 starts between Nationwide and Trucks before his Cup debut. Tony Stewart had 37 starts in those two leagues before his Cup debut. Junyer had 77 starts. The list goes on. And the aforementioned drivers lit the world on fire in their rookie seasons. 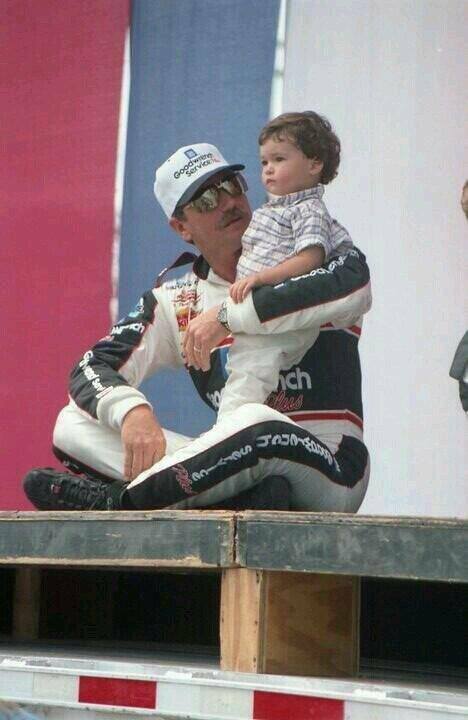 Logano was too young when he came to Cup. He was 18-19 in his rookie year and had only run one half of a season in Nationwide. Compare that to Austin Dillon, 24, who has years of NASCAR experience and had more Cup starts prior to his rookie season than Logano had Nationwide starts. What we're getting from Dillon now may very well be a fair sample of how good he's going to be. Rookie seasons shouldnt be an indication of an entire career. Jeff Gordon hit everything but the pace car his rookie year. IMO, both Dillon boys will compete for championships in the cup series. I feel Ty's driver attitude is better suited for the #3, but I guess Austin got there first. And Danica's rookie year wasn't that hot, but look at her now! Greg and ChexOrWrex like this. Austin will make his own legacy with the #3 car. The #3 should not be synonymous with aggressive driving, Dale Earnhardt should. Drivers make the legacy, not the number. If Chase Elliott hopped in the #24 car & started spinning people out & having a cocky attitude I'd say "**** chase elliott" not "**** the number 24". The #3 became know for aggressive driving, then it was retired for 13 years. IMO, Austin is in the #3 to help with sponsorship. Austin won't get many Earnhardt fans, but Ty would. Rookie seasons shouldnt be an indication of an entire career. I would honestly not put Chase in the #24 car when he comes up. Being put in the #24 as an immediate successor to Jeff Gordon is a TON of pressure for one kid to overcome. Have him run the #25. Of course, in the event that Jeff doesn't want to retire, I would pressure Stewart-Haas to end the Danica experiment and put Chase in the #10 car. When Jeff retires, Chase moves over to Hendrick, brings his number and keeps trucking. i agree that i think that if Ty started running the #3 when he comes to cup, that he would be more accepted from the sore Sr fans. I think Elliott may get Stewart's ride after what happened last night. I don't see sponsors wanting to be on Stewart's car for much longer after he killed a guy. It's not really another team. Elliott races for Jr motorsports which is owned by both Hendrick and Dale Jr and his sister. Stewart Haas racing is pretty much a satellite team for Hendrick. That being said, my previous post wasn't aimed at today's race. It was speculation for next year and beyond. Alsoknownasthis, Kiante, ChexOrWrex and 3 others like this. she is making the transition from open wheel for Christ's sake, give her five years or so. I don't quite know what it is about this picture but it really hit me. Maybe its just the Old Guard passing what they know to the future of the sport. DanicaFreak, sdj, be9ak7ts16 and 1 other person like this. So..... With the announcement of KK's contract extension, just how does Chase enter the Cup ranks? HMS is full. SHR is full. Jr Motorsports is not an option. They can't field a Cup team according to the rules. Where's he going to go? There are some things going on at SHR that may cause them to have an opening next year or in 2016.
how about taking it one year at a time, Hendrick said he was going to run another year in whatever ya call it.. case closed. You can bet money he will be running some cup races next year for somebody that will take a Hendrick car and put their number on it. Dale Jr signed through 2017. Kasey Kahne is now signed through 2018. Jeff Gordon says he's not retiring. Jimmie Johnson, he's not going anywhere. JR Motor Sports, not an option. HMS has to put him somewhere in 2016 if the previously announced plans are legit. The home for Chase Elliott may just Chip Ganassi Racing on a temporary basis. They have an alliance with HMS. He can run a limited schedule for HMS next season. It's within the rules to have more than four cars for that purpose.